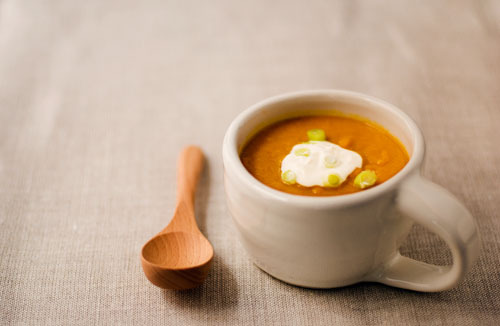 Last month, Heidi from 101cookbooks wrote up a recipe for Thai-spiced pumpkin soup that looked and sounded delicious. I must admit, in general, soup is not my favorite. I much prefer a more varied, crunchy meal to soup: I get bored quickly. But as the weather has turned, and knowing my husband is a soup-aholic, I have found my thoughts wandering toward soups. This particular soup sounded wonderful. When I do go for soup, I am generally drawn to spicy and flavorful. It’s the spices that attracted me to Heidi’s pumpkin soup. Trolling down the produce aisle last weekend, I noticed that pre-sliced, packaged butternut squash was in abundance. I immediately remembered the pumpkin soup and decided to put my own spin on the recipe based on what was available and easy. I snatched up a few packages of cubed butternut squash and a fresh, crusty baguette and set off to whip up a batch of soup. My take on the recipe uses (as mentioned) butternut squash and a combination of powdered Indian curries vs. the red Thai curry paste that I did not have. I followed Heidi’s method but ended up with a soup that looks thicker than her version, and garnished it with crème fraîche (and scallions), which provided a nice counterpoint to the heat. I sprinkled the squash with kosher salt and wrapped it in a foil packet with a few generous pats of butter. I roasted the squash at 375° for an hour or so until the cubes were tender, and then, similar to the pumpkin soup recipe, put the squash in a large saucepan on the stove over medium heat, brought it to a simmer with a cup or so of coconut milk, 2 teaspoons+ of yellow (turmeric-rich) curry, a teaspoon+ of a spicy curry mix, ¼ teaspoon+ ginger, and some very generous pinches of salt. I used my immersion blender off-heat to purée the mixture, brought it back to a simmer, and added a little water to thin it out. I adjusted the seasonings until I had a flavorful soup I was happy with. The whole apartment smelled wonderful! I could easily see a few additional variations on this soup. It would make a very nice amuse-bouche in a little shot glass topped with some crème fraîche. I could easily see a lower fat version made with plain yogurt vs. coconut milk or a yogurt-coconut milk combination. Of course, there are many different curry blends to experiment with and I’m sure all would work well. The addition of some fresh julienned ginger as a garnish instead of scallion would be nice too. Thanks Heidi for the idea! P.S. My father-in-law made the mug I used for a soup bowl - isn't it lovely? Beautiful photo. I think I'm coming around to these fall squashes, will have to give this a try. Agree with R, soup is a worthy meal. You can always use the "lite" coconut milk-I find the flavor comparable. Great post; Soup and a Photo. What more could you want? I love the mug - Spacious handle! I hate stingy handles. Your FIL has a fantastic talent. Your photo is absolutely gorgeous. Love the photo, the mug and the recipe! Also, I agree with your fan from Brooklyn, the "lite" coconut milk is very good. The soup looks delicious. Beautiful photo & mug. I love that mug. Does he make lots of other things as well? Thanks guys. On the mug, he makes all sorts of things. I'm trying to encourage him to get on Etsy! this looks like a very, hearetry soup -good for the cold weather. Larr's mug makes the dish "no pun intended complete"
i love soup, this looks delicious!